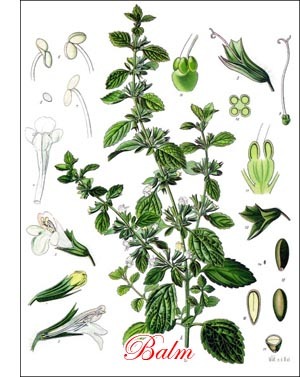 Balm (Melissa officinalis, Linn.) is a perennial herb of the natural order Labiatae. The popular name is a contraction of balsam, the plant having formerly been considered a specific for a host of ailments. The generic name, Melissa, is the Greek for bee and is an allusion to the fondness of bees for the abundant nectar of the flowers. Can wash the balm from an anointed king." As a useful plant it received attention from the pen of Pliny. From its home it has been introduced by man as a garden plant into nearly all temperate climates throughout the world, and is often found as an escape from gardens where introduced - occasionally in this role in the earliest settled of the United States. Very few well-marked varieties have been produced. A variegated one, now grown for ornament as well as for culinary purposes, is probably the same as that mentioned by Mawe in 1778. The roots are small and fibrous; the stems, about 18 inches tall, very numerous, erect or spreading, square; the leaves, green (except as mentioned), broadly ovate with toothed margins, opposite, rather succulent, highly scented; the flowers, few, whitish, or purplish, in small, loose, axillary, one-sided clusters borne from midsummer until late autumn; the seeds very small - more than 50,000 to the ounce. Balm is readily propagated by means of divisions, layers, cuttings, and by its seeds, which germinate fairly well even when four years old. Owing to its small size, the seed should be planted in a seedpan or flat in a greenhouse or hotbed, where all conditions can be controlled. The soil should be made very fine and friable, the thinly scattered seeds merely pressed upon the surface with a block or a brick, and water applied preferably through the bottom of the seedpan, which may be set in a shallow dish of water until the surface of the soil begins to appear moist. When an inch tall the seedlings should be pricked out 2 inches apart in other, deeper flats and when about 4 inches tall set in the garden about 1 foot asunder in rows about 18 inches apart. When once established they may be increased readily by the artificial means mentioned. Ordinary clean cultivation throughout the season, the removal of dead parts, and care to prevent the plants from spreading unduly, are the only requisites of cultivation. Preferably the soil should be poor, rather dry, little if at all enriched and in a sunny place. The foliage of seedling plants or plants newly spring-set should be ready for use by mid-summer; that of established plants from early spring until late autumn. For home use and market it should be cured as the leaves being very thinly spread and plentifully supplied with air because of their succulence. The temperature should be rather low. The foliage is widely used for flavoring soups, stews, sauces, and dressings, and, when fresh, to a small extent with salads. Otto or oil of balm, obtained by aqueous distillation from the hay, is a pale yellow, essential and volatile oil highly prized in perfumery for its lemon-like odor, and is extensively employed for flavoring various beverages.